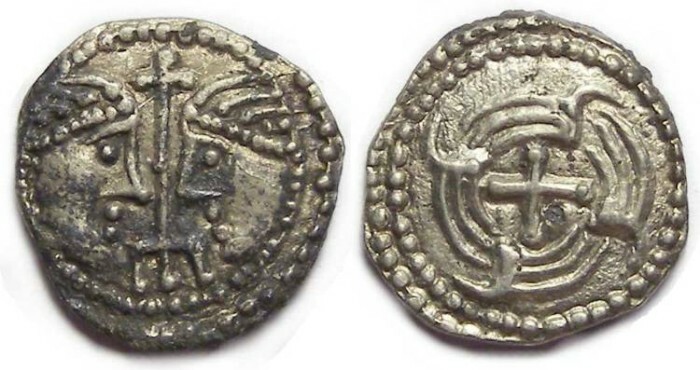 Britain, Anglo-Saxon, ca. AD 710 to 675. Secondary series sceattas. Mint : It is not known exactly where any given type of these was minted, but it was possible several mints in the south and east of England (especially in the Thames basin area). Size : 11.6 x 12.0 mm. Weight : 1.00 grams. Grade : gVF. Minor horn silver deposits on the obvese (removable but I saw no need to do so). Obverse : Two heads face to face. Reverse : a very stylized four birds in a circle around a small cross.